You’re looking at someone’s spiritual gifts on display. I snapped this picture on Easter Sunday morning just before our volunteers snapped the food up. This is the result of a couple of ladies – Vickie Jacob and Lynne Cox – doing what they love in order to fuel other people to do what they love. Vickie and Lynn head up the hospitality portion of our VHQ (Volunteer Headquarters) for our First Impressions Team. 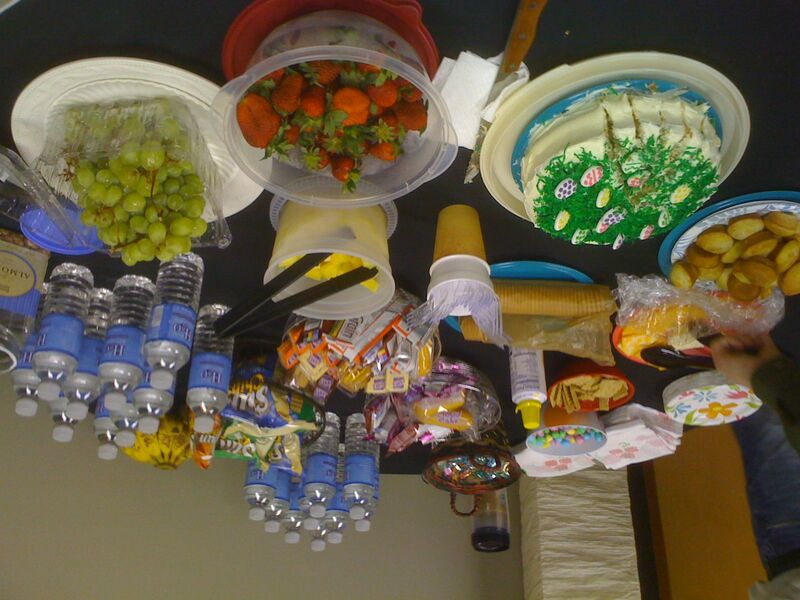 Every Sunday morning they stock a room with snacks, drinks, and conversation so that our vols can refuel during a few minutes of downtime. Sure, the fuel isn’t always this premium (I mean, it was Easter Sunday, after all), but the servant’s heart is always there. Frequently I’ll drop by VHQ to overhear Lynne or Vickie talking with a volunteer, catching up on their week, and encouraging them as they serve our guests. These two ladies serve those who serve others. They’re behind the scenes unsung heroes who keep our team running at top speed. Oh sure, sometimes they put us in a diabetic coma and expand our waistline, but I’d say it’s worth it. There were even mini Kit Kat bars on Sunday. Mini Kit Kat bars! That’ll preach. My point? You don’t have to be an up-front preacher, teacher, or singer to serve in the church. You have to figure out what you’re wired to do, and do that thing well. That’s what Vickie and Lynne do every single week, and that makes ’em super heroes in my book. Super heroes indeed! Wonderwoman and Supergirl to be more exact. That was a serious spread. Thank you Lynn and Vicki for all you do.